”SpringWalker” Exoskelton – FOP Shvachko V. V.
SpringWalker Exoskelton is a self-actuated spring-action human bipedal device that includes a back-mounted frame attached to the upper torso of a user, and separate articulated right and left leg frames pivotally attached by U-joints to lower portions of the back frame. 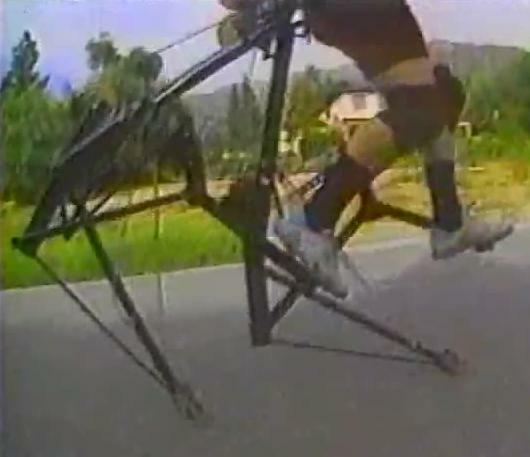 The user’s feet are secured to the leg frames so the bottoms of the leg frames contact the ground, behind and below the point where each foot is attached to its leg frame. Endless cord-like main springs are engaged with a spring actuator, which are carried on the back frame. The energy stored in the stretched main springs is then transferred back to the torso of the user and to the user’s feet to cause the user to jump into the air. Separate pick-up springs connected to each leg frame keep the tension lines under positive tension and apply a pick-up force to the leg frame to raise it and prevent dragging. SpringWalker is a mechanical system that provides the flexibility of motion, amplifying of forces and recovering of energy that are necessary for extending the human locomotion abilities. 1. 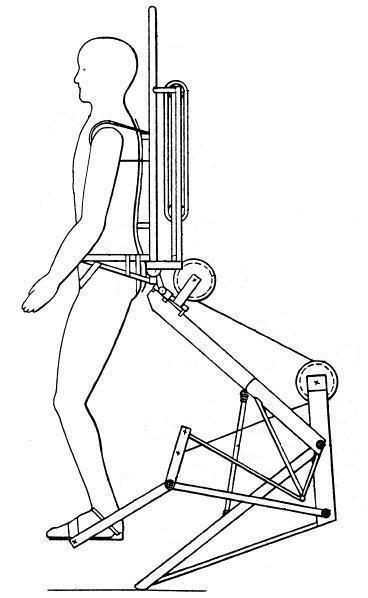 Human bipedal locomotion device. – Mode of access: http://www.google.com/patents/US5016869. 2. SpringWalker Body Amplifier – Powered Exoskeleton – Legged Vehicle. – Mode of access: http://springwalker.com/. 3. The SpringWalker by Applied Motion. – Mode of access: http://www.youtube.com/watch?v=U_7Nn82bDug. 4. Springwalker Exoskelton. – Mode of access: http://www.youtube.com/watch?v=yRDUfOdpNOI. 5. Springwalker – Human Power Enchancer. – Mode of access: http://www.youtube.com/watch?v=YLwx1cgUXTA.